The largest independent paint stores in Sweden, has over 170 stores in Sweden and purchasing collaborations in Norway and Finland. The paint brand is a typical chain-store which was developed in order to efficient operation since they have hundreds of product for their customers to purchase. The main purpose of the paint brand is to sell goods directly to consumers; therefore, the operators need to smooth the checkout process and make a good customer experience. The previous POS terminals in paint store were out of date because of the low efficiency and unfashionable appearance. ToriPOS 915 compounded with Intel 3rd Generation Core™ i5 3550S – Quad-Core 3.0GHz. This is what a chain-store need. A high standard processor can process High transaction volume in a limited time without error. ToriPOS 915 is designed with the sleek front panel and the compact computing module in the base. The upward facing connection points and modularized components also promote the machine to be like an artistic product. ToriPOS’s little foot made a big space-saving at counter area. The frameless projected capacitive touch panel of ToriPOS 915 enhanced user behavior and made the checkout process easily and rapidly. Because the clerks don’t change the input tool anymore, they can check out for one after another customer smoothly. 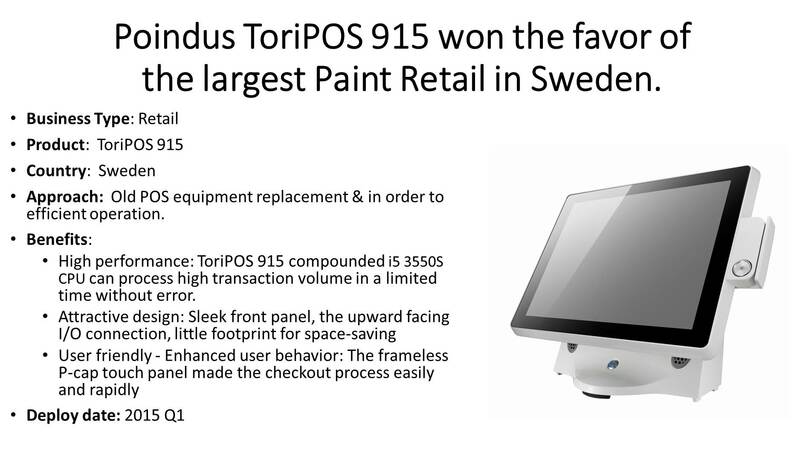 ToriPOS 915 is a pioneer POS system for retail industry with leading components integrated. ToriPOS 915 is always fast and reliable and can immediately benefit the business. It is a worthwhile investment for the Paint Retail replacement the old POS system to ToriPOS in long term. They will be more efficient with ToriPOS in the future. Poindus will be the trustiest partner in your business.